Where do I find image credits? 1. Amanita sp-BEL01, Belize Zoo Research Camp, Cayo, Belize. cap The cap of this species is 35± - 90 mm wide, pale beige-brown (pinkish brown) in the center, paler at the margin; the pigment is not evenly distributed—the cap appears subvirgate or densely freckled. At first, the cap is somewhat bell-shaped, then hemispheric, and eventually planoconvex. 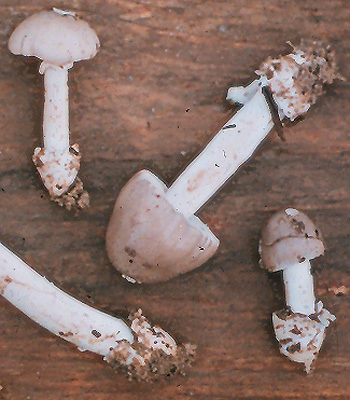 The cap's flesh is white, up to 7 mm thick above the stem. The cap's margin is apparently rather short striate and incurved at first, but eventually straight. Volval remnants may be absent or (occasionally) are present as small, white, off-center, membranous patch. gills The gills are free to narrowly adnate, 8± per mm when counted at the cap's margin, white when fresh, whitish to sordid tan in dried material, up to 10± mm broad, and somewhat teardrop-shaped with the broadest region nearest the cap margin. 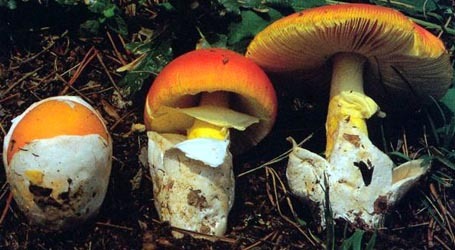 The short gills are subtruncate to truncate, common, and of diverse lengths. stem The stem is 40± - 110 × 6± - 10 mm, white, cylindric, and narrowing near its very top. The stem's flesh is white, stuffed at first, becoming hollow, with the central cylinder ?? mm wide. The ring is white, skirt-like, pendulous, membranous, attached to the stem 3.5+ mm below the cap's margin in the largest specimen (with plano-convex pileus), and measuring up to 12 mm (radially) from the stem to the edge of the ring (in the same specimen). The volval remnant at the stem's base is in the form of a cupulate to saccate volva, membranous, white, 11± - 20 mm from the stem's base base to the highest point of the volval limb, and 10± - 13 mm wide. odor/taste The odor is mildly radish-like. Taste was not recorded. spores The spores from the single known collection measure (10.0-) 10.2 - 13.2 (-13.8) × (5.8-) 6.5 - 7.8 (-8.2) µm and are ellipsoid to elongate and inamyloid. Clamps are present at some bases of basidia. etymology Belize + -ana, suffix indicating possession; hence, "of Belize"
GenBank nos. Due to delays in data processing at GenBank, some accession numbers may lead to unreleased (pending) pages. These pages will eventually be made live, so try again later. intro Olive text indicates a specimen that has not been thoroughly examined (for example, for microscopic details) and marks other places in the text where data is missing or uncertain. The following material is based upon original research by R. E. Tulloss. pileus 35± - 90 mm wide, pale beige-brown (pinkish brown) over disc, paler at margin, pigment not evenly distributed (subvirgate or appearing densely freckled), at first subcampanulate, then hemispheric, eventually planoconvex, rather dry[? ]; context white, up to 7 mm thick at stipe; margin ? ?short striate?? (0.? ?R), incurved at first, eventually straight; universal veil absent or (occasionally) as a small off-center, white, membranous patch. lamellae free to narrowly adnate, 8± per mm at margin, white when fresh, whitish to sordid tan in exsiccata, up to 10± mm broad, sublachrimiform with broadest region nearest pileus margin; lamellulae subtruncate to truncate, common, of diverse lengths. stipe 40± - 110 × 6± - 10 mm, white, cylindric, narrowing near apex; context white, stuffed, becoming hollow, with central cylinder ?? mm wide; partial veil white, pendulous, membranous, 3.5+ mm below pileus margin in largest specimen (with plano-convex pileus), up to 12 mm (radially) from stipe to edge; universal veil as cupulate to saccate volva, membranous, white, 11± - 20 mm from base to highest point on limb, 10± - 13 mm wide. odor/taste Odor mildly radish-like. Taste not recorded. lamella trama bilateral, with very shallow angle of divergence, with divergent elements occasionally curving to form an angle of divergence of up to 30°; wcs = 65 - 75 µm (moderate to very good rehydration); filamentous, undifferentiated hyphae 2.8 - 7.5 µm wide, frequently branching, interwoven to tangled, with broadest constricted at septa, with slightly inflated intercalary cells (e.g., 80 × 17.2 µm, having walls thin or up to 0.8 µm thick), with some of these intercalary cells originating in central stratum (e.g., 58 × 13.2 µm) diverging into subhymenial tree and giving rise to elements therein; terminal, inflated cells not observed; vascular hyphae not observed; clamps not observed. subhymenium wst-near = 25 - 40 µm (very good rehydration); wst-far = 40 - 50 µm (very good rehydration); frequently branching structure containing many uninflated hyphal segments and occasional inflated (up to 17.0 × 10.0 µm) or partially inflated cells, with basidia arising from cells of all types; clamps not observed. basidia 45 - 70 × 7.2 - 13.5 µm, 4-sterigmate, with rather short and stubby sterigmata (e.g., 5.5 × 4.2 µm); ? ?clamps and proliferating clamps occasional in some regions, but apparently rare throughout most of hymenium??. [41/2/1] (10.0-) 10.2 - 13.2 (-13.8) × (5.8-) 6.5 - 7.8 (-8.2) µm, (L = 11.6 - 12.5 µm; L’ = 12.0 µm; W = 7.2 - 7.3 µm; W’ = 7.2 µm; Q = (1.47-) 1.50 - 1.81 (-1.83); Q = 1.62 - 1.72; Q’ = 1.67), hyaline, colorless, thin-walled, smooth, inamyloid, ellipsoid to elongate, adaxially flattened, often expanded at one end; apiculus sublateral, cylindric to narrowly truncate-conic; contents monoguttulate, occasionally with additional small granules; color in deposit unknown. ecology Subgregarious. In duff of Pinus caribaea var. hondurensis woodland. material examined BELIZE: CAYO DISTR.—Belize Zoo Research Camp, 15.vi.1993 Michael A. Vincent & R. J. Hickey [Vincent] 6034 (MU F39533; RET 094-5). Sporograph comparisons for the present species and A. sp-F16 and A. sp-CR13 are presented in the following diagram. 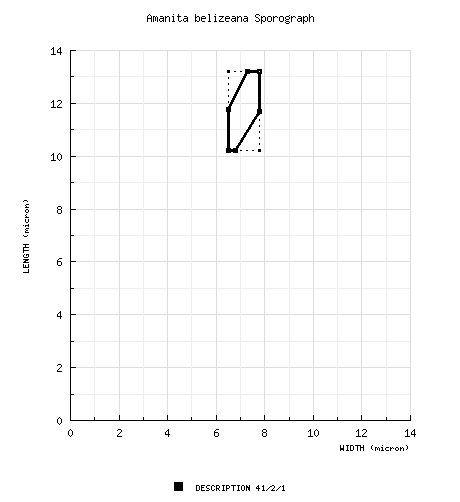 A sporograph for the latter taxon will appear in the figure when spore data is entered on its technical tab. Information to support the viewer in reading the content of "technical" tabs can be found here. photo Michael A. Vincent - (1) Belize Zoo Research Camp, Cayo, Belize. Each spore data set is intended to comprise a set of measurements from a single specimen made by a single observer; and explanations prepared for this site talk about specimen-observer pairs associated with each data set. Combining more data into a single data set is non-optimal because it obscures observer differences (which may be valuable for instructional purposes, for example) and may obscure instances in which a single collection inadvertently contains a mixture of taxa. select a collection to review/add spore measurements..#785064. Michael A. Vincent & R. J. Hickey, #s.n.=>Vincent, BELIZE, CAYO DISTR.,.. Text and User-Generated Sporographs are published under the Creative Commons License. In the case of a taxon page, image credits are on the 'image' tab.